You probably heard that mobile data collection increases business efficiency and productivity. But is it worth your time to switch from the current process to the mobile forms data collection? This article helps you make an informed decision. It will help you understand what mobile forms are and what you can achieve by using them. You will also learn how to incorporate mobile forms into your business workflow without interruption of the current process. Online (web) form is a form that you fill out in a web browser. You can do it on a desktop computer, tablet or a smartphone. For the smartphone, a form should have a design optimized for a mobile device. Although web forms may work well for you, they have several disadvantages as compared to the native mobile applications forms. Mobile forms are faster and more responsive. Mobile forms can include photos, voice recording or video (taken with a mobile device while filling out a form). Mobile forms allow for barcode / QR code scanning. You can capture signatures using mobile forms. Mobile forms can capture GPS location. Mobile forms can be filled out offline. Mobile Forms Creation Using Web Interface. Filling Out Forms On A Mobile Device. Processing And Delivering Collected Information. Faster completion with minimum manual entries. Instead of entering information manually, users can select from the lists or scan in data. Part of the information can be already pre-filled, so an employee only fills out data related to his own work/observations. Automatic data validation based on the data type and required fields. Data validation and less manual entries help reduce errors and save a lot of employee-hours. A person can use a smartphone to take photos and include them as a part of a form. This is much faster and more accurate than taking photos with a digital camera, uploading them to the computer and connecting to the form later in the office. Mobile form can be signed right on the device. Digital signature will be included as a part of the record. An employee can use a smartphone as QR code/barcode scanner to scan and identify an object for which data are being collected. (S)he can also scan data in the form fields instead of entering them manually (for example part numbers, lot numbers, etc.). GPS location of the form submission is automatically recorded. Office employees can have a quick overview of the projects locations by reviewing forms submissions points on a map. Mobile forms help you modernize the entire team workflow. Each team member can get more done in the field. Everyone on the team has an immediate access to the collected information and can act on it quickly. There is no back log of collected data that someone needs to enter into the computer manually. This saves you countless employee hours and eliminates a tedious job of data entry. Mobile forms minimize manual entries. Whenever possible users can select a value from the list or scan data in. Data entered into the mobile forms are auto validated, preventing errors and missing information. As an employee fills out a mobile form, the entered data are auto saved on his device. Data are sent to a storage location when the form is completed - preventing costly data loss and necessity to re-do data collection. With mobile forms, all authorized employees have real time visibility into the business operations, projects status and progress, and all collected documentation. They can review and analyze submitted data in real time, making more informed business decisions. You do not need to reprint multiple paper forms each time you adjust a process or standard operating procedure. You can do an adjustment to the corresponding mobile form online in minutes. Once an update is done, your employees will have current instructions/form on their mobile devices to fill out. Finally, as an extra benefit, you save trees by using less paper. Any mobile forms data collection software will give you a way to create custom mobile forms using a web interface. The way of creating the forms may vary: you may have a drag-and-drop interface or will have a list of form fields that you can add, delete or edit. If you plan to use the forms on a tablet, and you need to position form fields in a certain way, a drag-and-drop interface is a plus. If you plan to fill out forms on a smartphone, a small screen leaves a few option for fields arrangement. In this case, a list edit may be a better option - it is faster and helps you avoid visual clutter. You will have an option to create different field types (input, list, checkbox, on/off switch). For each field, you will indicate if it is required or optional, and define a field data type. The exact set of the field data types will differ in different software packages. The basic data types will be text, number, and date. You also may have "media" field types (image, voice recording, video. These fields will allow a user to take a photo or record a voice message and make it a part of the form. You may have scan-in fields, that will allow users to scan in data from QR codes or barcodes into the field with a smartphone. You may have GPS field, that will allow a user to capture a location. In some instances, you will be able to add a skip logic to the form (e.g. if field A is selected show section A, otherwise hide it), and add calculations. You may be able to use an existing form as a template, and change several fields to create a new form. This will significantly speed up your form creation process if you have many similar forms that differ in a few details. You may be able to bulk import forms from a delimited text file. This option may work well for you if you are currently using a spreadsheet to collect data. Some software vendors will have a library of generic forms that you can use, as is or with some changes. You may outsource the form creation part to the software vendor. Many mobile forms software providers will have a service to migrate the current forms to their software for you. Online (web-based) part where you create mobile forms, review and analyze form submission records. Mobile application where you fill out the forms. There will be separate mobile applications for Android, iOS and possibly Windows phones. User privileges. You may be able to define which forms user can see based on his work qualifications. What user is working with. You may be able to create different forms for different groups of assets, equipment, properties or other business objects. Current project status or workflow step. You may be able to link mobile forms to the steps in the workflow. If you do, only forms that are relevant to the current step will be available for selection. The user can open a correct form on his/her mobile device, fill it out and submit to the back-end storage location. Submitted data are immediately available to the other members of the team to review/analyze/act upon. Many mobile forms applications will allow you to collect data offline and submit the form when a connection is available. In most cases data collected with the mobile forms are submitted to a centralized cloud location. You access collected data online via a web dashboard. The data can be converted to the documents (PDF, Word, etc. ), stored in the database, or both. Database storage is usually preferable. It allows you to query submitted data by multiple parameters (including data in the specific form fields). You can also export data for import into the other internal applications. Receiving an e-mail with collected data when a form is submitted. Auto-generating documents, such as PDF, and sending them to your documents storage location (GoogleDrive, OneDrive, Box, Dropbox, etc.). Storing collected data directly in your company's internal database. Generating a report from collected data and sending to the team member(s) or a customer from the mobile device. Forms do not exist in a vacuum. Whenever you fill out a business form, it is related to an object you are working with. An object can be an asset, property, customer, employee or something else. There are situations when you need to fill out a form for an object once - for example if you are doing one-time installation, service or inspection for a customer. In these cases, the ability of a software to link forms to the business objects and workflow is not critical. As a rule, you will just enter customer information in the header part of the form. There are a lot of business scenarios, however, where you need to collect data for the same object on the regular basis. Often these forms will not be self-contained but a part of a workflow. 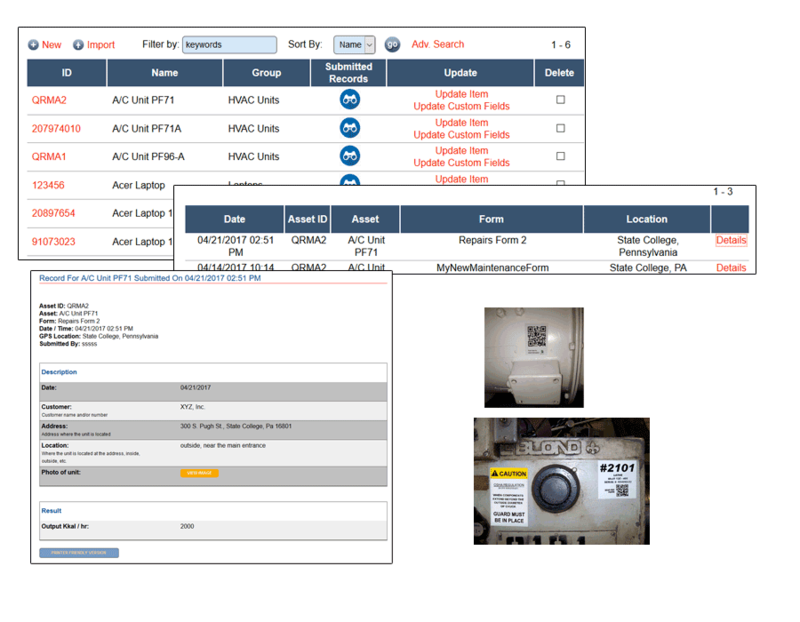 For example, if you need to record equipment maintenance, service, and repair, or need to do routine inspections of a property, you will need a way to link all collected information to a specific equipment or property. If you need to document a business process that consists of multiple steps, you need to link the forms to both an object and a specific step of the process. This way your employees will have a roadmap of a process. They will know exactly what to do and what form(s) to fill out on every step. You will have real time access to each process status, progress, and documentation, as well as lifetime history of each asset. If your business operations require linking of the collected information to an object and/or process, look for a workflow software with mobile data collection capabilities. QR Mobile Data is this kind of a software. 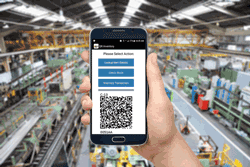 It uses QR code/barcode scanning to uniquely identify an object and its current status and provides relevant information and a list of forms to fill out to the user. Which mobile devices are better to use for the field data collection? Depending on the type of forms you have and the data collection environment, you may opt for either smartphones or tablets (or both). As a general rule, you may want to use tablets if your forms must have a specific layout that is hard to reproduce on a small screen of a smartphone. Tablets will work well if employees are collecting data in the office-like environment and do not need to carry a device with them all the time. For example, if you need to collect data in the store, or on the factory floor, or for the home inspection a tablet will be a good tool to use. If your employees are always on the go, then a smartphone will be a better choice. It fits into a pocket and is much easier to carry around than a tablet. Another consideration is a cellular data connection. In the field or remote places where wi-fi is not available cellular data connection often is. It is true that many mobile forms data collection applications will work offline as well. However, you cannot submit collected data until a connection is available. Therefore, having a connection is definitely a plus. Where do you get the mobile devices for the data collection? The most efficient solution is to let your employees use their own smartphones or tablets. Not only you won't need to purchase extra hardware, but each employee will be working with a device (s)he is already using and familiar with. This will streamline an adoption of a new system and eliminate a learning curve, so you will become productive faster. What if you need special devices which can be used in rugged field conditions? Take a look at CipherLab RS 30 Series. These are modern mobile computers with Android operating system which are specifically made to withstand the harsh environment. The best technology is what you have and know how to use. Since nowadays almost everyone owns a smartphone or a tablet (often both), you won't lose much time on training and adjustment. Your employees are already familiar with your current forms and processes. You just need to show them how to navigate the mobile application for data collection. If you plan changes to your current process due to implementation of the mobile data collection, outline these changes as well. As a rule, mobile forms software providers will have plenty of materials to help with the system adoption (instructions, FAQ, videos). They may provide a webinar style training for your employees as well, making your job much easier. Keep in mind though that the best learning is by doing. So the good strategy would be to let your employees start using mobile forms data collection, and provide support during the transitional period. You can educate team leaders on the new system first. Team leaders then will show the mobile application to their team members and will be on hand to answer questions and provide guidance. The best strategy for adoption of a new system is to deploy it one step at a time. Transition to the mobile data collection is no exception. Choose one unit of the company and/or a specific process to transfer to the new software first. For example, start with only one production process. Let your employees learn how to do things - then gradually move other processes to the mobile data collection. 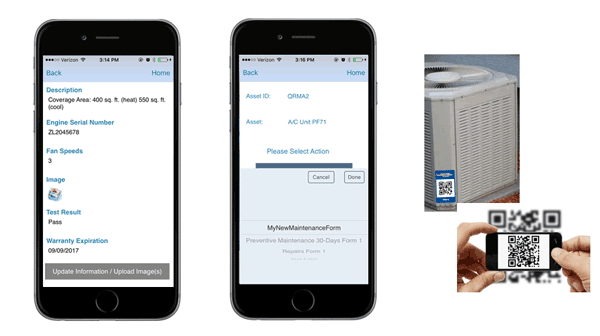 Or start using mobile maintenance forms for one equipment group. Once your employees are comfortable with the new process, add other groups. If you have multiple divisions, roll out mobile forms data collection system in one division. Iron out any kinks, then start implementing the system in the other divisions. When you design the roll out strategy, make sure that you won't end up with the same process/objects/forms being done in two different ways. If you do, you will make your data organization and productivity worse instead of improving it. For example, it won't make sense to have half of the employees fill out mobile maintenance form, while another half continues to fill out the same exact form on paper. You will have a mess on your hands and will have a hard time processing the results. However, it will make sense to switch only maintenance process/forms to mobile data collection system first. After your employees are used to the new system, do the same for the service and repair. The same is true for all other use cases. Pick the entire process or unit of your operations that will benefit the most from the transitioning to the mobile data collection. Start there - then implement the system for other processes/units. Link mobile forms to the business objects you are working with (equipment, assets, properties, projects, customers, employees, etc.). Link mobile forms to the steps of the process. Use QR code scanning to identify and track business objects, record and access data in the field. Track stages of the process and what was done on each step. Get a coherent picture and organized documentation on your business processes and lifetime history of the business objects you are working with. Track assets and inventory for the production processes, achieve backward and forward product traceability. Whether you need to keep track of equipment maintenance, report assets or equipment conditions in the field, keep track of the projects or production processes, mobile data collection will make your life easier and will save you from the problems associated with the data loss and errors.